In August last year, our own Nils von Kalm, and independent evaluator, Tim Budge, visited our Australian Government-funded project in Gaza, the Ahli Arab Hospital. They went to plan future work with the hospital and their support of women with breast cancer. 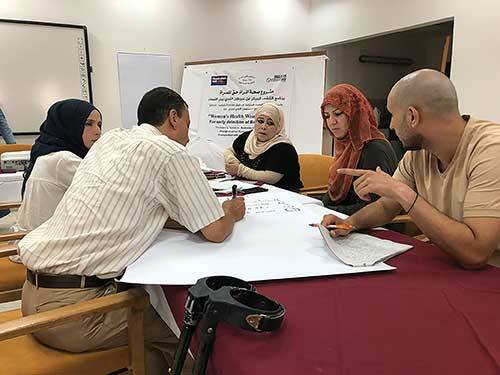 Part of the time in Gaza involved workshops like this where leaders of Community-Based-Organisations and women with breast cancer worked together to determine the direction of the next phase of the project. Getting into the taxi at Ashkelon on Israel’s coast to make the trip down to the Erez crossing at Gaza, our driver didn’t understand at first that we actually wanted to go into Gaza. When we assured him that that is what we wanted to do, he quickly dropped us off and left us to go through the checkpoint. Life in Gaza is a constant, daily struggle for its 1.8 million inhabitants. My colleague, Tim, and I, had been here before, but since my last trip in 2016, the situation had deteriorated. Electricity is on for only 6-8 hours per day and most of the water is contaminated. The air and sea space is controlled by Israel, and residents cannot leave without a valid permit. The environment is oppressive. Life for women in Gaza is particularly difficult, but if you are a woman with breast cancer in Gaza, your troubles are compounded. Survival rates for breast cancer in Gaza are approximately 40 percent (compared to 85 percent in Australia). Then, there is the cultural stigma. If you are a young woman and your mother or aunt has had breast cancer, you will most likely not be considered to be marriageable and will be ostracised. Marriage is culturally important as it provides stability and can keep women out of poverty. However, it is not uncommon for men to leave their wives who have breast cancer. Sometimes they may also take another wife, disrupting the family order. Addressing these stigmas is just part of the work we are doing with the Ahli Arab Hospital. The purpose of this trip was to speak with administrators at the hospital and many of the community-based organisations (CBOs) it works with to plan the project’s priorities for the next four years. Ahli Arab Hospital works with an impressive 40 CBOs throughout Gaza. This makes them a very important part of the health infrastructure, giving them much social value and ensuring they are a vital part of providing the community’s health needs. These CBOs refer women to the hospital for screening, so the relationship between the CBOs and the hospital is strong and interdependent. Maha (middle) has breast cancer and has received support from her husband (on her left). He has been a wonderful example to educate other husbands of women with breast cancer in how to support their wives. Our first meeting took place in Rafah, down near the Egyptian border. There we met with the Sahem Association for Cancer Patients. Just about every CBO we met with emphasised the need for the education of men in their attitudes towards their wives. Sahem is one of those organisations which is seeking to ensure that men are part of the process of supporting their wives once they have been diagnosed with breast cancer. In 2017 there were 1,680 cases of cancer in Rafah. Of these, approximately 680 were breast cancer. Despite these numbers, there is good news coming out of Rafah. One woman we met with breast cancer, Maha, is now recovering and working. She is raising the profile of cancer patients in Gaza. And her husband, Basem, is standing out as a role model of a supportive husband to other men. Basem cuts Maha’s hair and even had his own head shaved in solidarity with her when she went through chemotherapy treatment. Our project in Gaza has been called Women’s Health, Women’s Rights, however with women’s rights still a major issue, there has been an agreement to look at how to strengthen the rights advocacy work in the next phase of the project. This issue came up with all of the nine CBOs we met with. As well as reaching out to men, the project will also aim to reach out to women in border areas of Gaza, and also to women with disabilities. Speaking with the women from the CBOs, as well as those with breast cancer, was a moving and eye-opening experience. The resilience among these women is astonishing. Despite the daily struggles of living in an occupied land and facing cultural stigma, often from within their own families, they move forward with hope. We ask you to join us in praying that this resilience and hope will remain strong as the hospital and the CBOs continue to work together in the next phase of this ongoing project.